V. S. Ramachandran’s The Tell-Tale Brain: A Neuroscientist’s Quest for What Makes Us Human is a cornucopia of fascinating material. Many of the ideas offered are well established, but Ramachandran is not afraid to venture some risky hypotheses. Some of these give a common explanation for several findings whose connection to each other is not initially obvious. These explanations provide good models for what neural understanding of ourselves ought to look like, even if the evidence may eventually turn out against some of them. 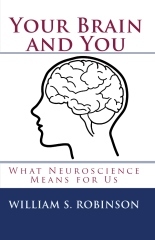 One of the featured topics of the book is mirror neurons. These are neurons that fire (a) when you do an action of some kind, for example, grasping something with your hand; and (b) also fire when you see someone else doing that kind of action. Mirror neurons were first discovered in macaques by G. Rizzolati’s team in the late 1980s. They have been shown to exist in people, have been actively investigated by many researchers. I am not going to go into the controversy over whether deficiency in the mirror neuron system is the key to understanding autism. The chapter in which this claim is offered is a riveting section of the book, and it is up to those with access to laboratories to sort out how well the theory can be supported. Instead, I’m going to reflect a bit on a suggestion Ramachandran makes in answer to the question of what prevents us from blindly imitating every action we see. Or, since we also have neurons that fire both when we have a sensation and when we see others in circumstances likely to cause the same kind of sensation, why don’t we actually feel a touch on our own bodies when we see others touched? Well, according to a 2009 review by Keysers and Gazzola, there are studies showing that there are some people who do have such sensations. (They say about 1% of people.) And Ramachandran mentions echopraxia, a condition in which “the patient sometimes mimics gestures uncontrollably”(p. 125). So the question really is, why aren’t these phenomena more common than they are? A simple answer that Ramachandran does not discuss is that, in most of us, only *some* of the neurons in the premotor areas are mirror neurons. It may be that there is some tendency for us to mimic observed gestures, but we just don’t have enough mirror neurons to lead to actual execution of that tendency, in normal conditions. What Ramachandran does say in answer to his question is this: “In the case of motor mirror neurons, one answer is that there may be frontal inhibitory circuits that suppress the automatic mimicry when it is inappropriate. In a delicious paradox, this need to inhibit unwanted or impulsive actions may have been a major reason for the evolution of free will. Your left inferior parietal lobe constantly conjures up vivid images of multiple options for action that are available in any given context, and your frontal cortex suppresses all but one of them. Thus it has been suggested that “free won’t” may be a better term than free will” (p. 124). It seems evident to me that we are not ordinarily aware of suppressing tendencies to do what we see others doing. For example, suppose we’re having a drink with friends, and have already said “Cheers” and taken our first sips. Thereafter, we all see each other picking up our respective glasses, but in general we don’t take our further sips in near-unison. Yet we are not consciously aware of suppressing the lifting of our own glass every time we see one of our friends lift theirs. So one intriguing aspect of Ramachandran’s picture is that, if we combine it with the observation just made, we would be led to conclude that there is a tremendous amount of unconscious processing going on whenever we see others acting. This consequence would be one illustration of our dependence on unconscious processes – a theme that will be familiar to readers of Your Brain and You, or of several other posts on this blog. But I think that most of those who write about “free will” would not find these processes to be a plausible explanation of the beginning of “free will” – or of “free won’t”. That is because the centrally important cases for those who write about “free will” are situations in which one is quite fully conscious of at least two alternatives, and in which one has time to think about the consequences of doing each of them. For example, if one tells a lie to avoid revealing some embarrassing fact about oneself, one generally knows what the fact is and what the lie would be, and one has at least a little while to consider the consequences of honesty, the likelihood of being caught in a lie, and the consequences of having one’s lie exposed. Writers about “free will” are generally thinking of cases where people are aware of a good reason to do something and also aware of a good reason to do something else. The real question about “free will” is what (if anything) makes one of these reasons prevail over the other. It’s the same for “free won’t”. That’s just a special case of “free will”, where one of the options is phrased as “I won’t do action A – I’ll just sit still and do nothing”. If we have a case where one is not conscious of a reason to sit still and do nothing, it won’t be a case that writers on “free will” will regard as having anything “free” in it. Of course, there has to be a difference between thinking of a possible action and doing it, and so ability to inhibit seems to be a required condition for possession of what anyone would count as ‘free will”. But inhibition by itself does not take us very far. Even a lion stalking its prey inhibits its running until favorable circumstances trigger its attack. This entry was posted on Wednesday, April 6th, 2011 at 5:53 pm and is filed under RE: "free will". You can follow any responses to this entry through the RSS 2.0 feed. You can leave a response, or trackback from your own site. One Response to “Free Won’t”?